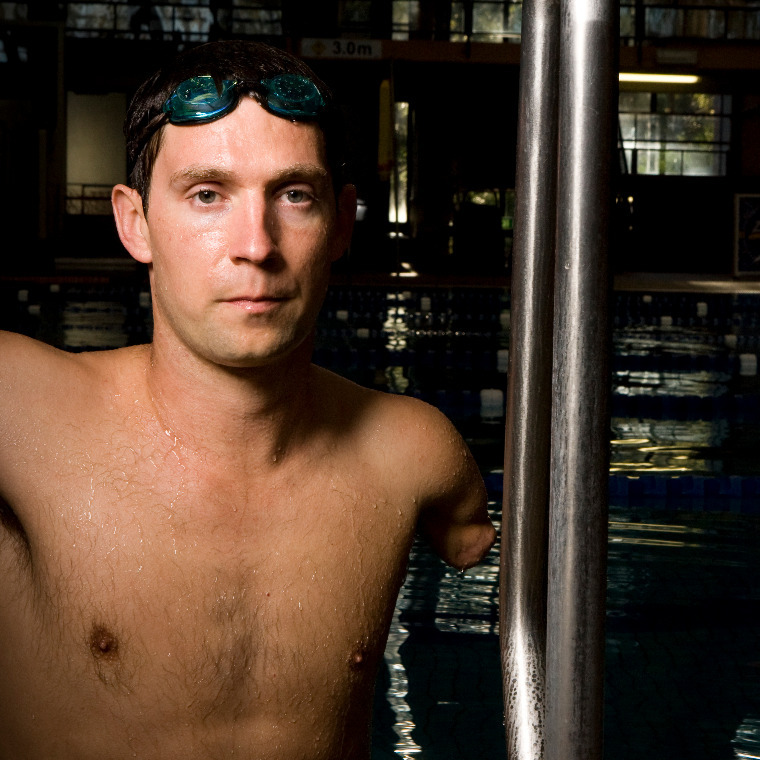 Ben Austin is one of Australia's most successful Paralympian swimmers. Born In the small country town of Wellington in the Central West of New South Wales in Eastern Australia. Ben had his left arm amputated when he was only two years old due to birth complications. His parents made plans when he was still very young, to help him to grow up happy and well adapted to an able bodied society, and saw sport as an ideal way to gain a positive body image and good self esteem. But not many including his parents would predict just how much of a natural Ben would become in the water. By the age of only 4 years old he was awarded the youngest boy swimmer by the local swim club, and by the time he was in primary school he was an undefeated age champion competing against able bodied athletes. This continued right through his high school years were he remained undefeated in his age group and gained representative honours. Ben's parents enthusiasm to encourage their son to try anything, was severely tested when he decided that he wanted to play the tough sport of rugby League at only 8 years old. Eventually he persuaded his parents to allow him to play, in which he soon began to display raw and natural ability on the field. He would go on to play for ten years were he gained representative honours for his school. Other sports he became passionate about and excelled in were basketball and water polo. Even though he was successful in sport and became a local icon, Ben was dealing with depression and experienced some acts of discrimination. And though he had great family support, a positive body image and admiring fans in his community, he would quickly learn that the physical limitations he learned to overcome in life, were only half the battle in comparison to overcoming the limitations of his mind. Ben drew on all the strength, determination and desire he became renowned for through sport, to begin the journey of overcoming his self perceived image and mental barriers by setting the bold goal of competing for Australia as a swimmer at the Sydney 2000 Paralympics games. The year was 1999 Ben had just turned 18 and his goal was even the more bold because he had never trained seriously for any sport in his life relying solely on his natural abilities. And he had only six months to achieve an elite level of fitness in order to compete in his first Olympic trials. He qualified for the Sydney 2000 games, and went in ranked world number one for the 200m individual medley as well as achieving top five world rankings in the 100m & 50 metres freestyle and butterfly events. At the Sydney Paralympics, Ben went on to achieve two silver, and two bronze medals, narrowly missing gold in the 200m individual medley. This amazing transformation from a relative unknown on the international stage to a future star in the making inspired and aroused the imagination of not only his community but also the wider community of Australia. Ben Austin stepped out of the shadows of self, and began to realise the possibilities that lay before him. He began to dream of bigger and better things as an elite athlete with all the attributes that had got him to that point and the new skills he was honing and learning along the way, most notably - hard work, self belief, persistence and the consistency to take the small steps necessary each day, that would lead to the opportunity of taking the BIG step towards realizing his goals. The birth of an international swimming star had only just begun. Ben Austin went on to become a true pioneer of Australian swimming and sport, by bridging the gap of respect, recognition and equality to the Paralympic swimming movement in Australia, through his awe inspiring achievements and ever growing public profile. Ben's style, stamina and speed captured the imagination of not only the Paralympic nation but also his fellow Olympic adversaries. Some top Olympic coaches and swimmers claimed he possessed one of the worlds fastest and strongest kicks amongst able bodied or disabled. He went on to have a successful ten years as an elite athlete, leading the Swim team as captain into two Paralympic Games and competing in three Paralympic Games, Three Commonwealth Games, Two World Championships and numerous internationals all over the world. Winning Eleven Paralympic medals, three gold, five silver, three bronze and numerous gold medals in many international competitions along with 15 world records and 81 national records. Ben learned many valuable life lessons moving through the ups and downs of a professional sporting career. He now is a renowned motivational speaker who is passionate about inspiring and sharing his amazing and awe inspiring journey from his early struggles with depression into a life of purpose through his transformation into a world champion swimmer. He has dined with Queen Elizabeth by personal invitation. Been awarded at the state government house the distinguished order of Australia medal for his services to sport and advocating on behalf of athletes with a disability, by raising their profile through his performances. And for tirelessly spending his time speaking to kids nationwide in an effort to awaken their pure potential into action and bring awareness to the Paralympic movement. He was a Young Australian of The Year Finalist. The 2002 Manchester Commonwealth Games were an Historic event, as it was the first time in history that elite athletes with a disability would be included in the same team as able bodied elite athletes with their medals included in the official medal tally. Ben was one of only four elite athletes with a disability selected in the team, were he went on dominate all competition before him to break four world records and win two gold medals in the freestyle sprint events. Along with Ian Thorpe and the Australian Cycling team, Ben was the only other Australian to break world records at the games. Coming home to Australia with most World Records broken at the Games. In the 2004 Athens Paralympic games he became one of the first swimmers in his S8 category class to break the one minute barrier for the 100m freestyle. He was also the first Paralympic Swimmer to gain a full live in scholarship at the Australian Institute of Sport, Many years before a Paralympic Swim Program would exist at the Institute of Sport. He was the first Paralympic Telstra Dolphins Ambassador and also the first Paralympic Ambassador for Austswim. Along with many other Accolades and Achievements in his Ten year professional Swimming career, he rates contributing to making a difference to the community in his local area and the wider communities of the world through his motivational speaking up there with his finest achievements. He now hopes to continue empowering the youth and people all of the world, through the sharing of his inspiring story to ignite today's youth into positive action and reach their full potential in life.